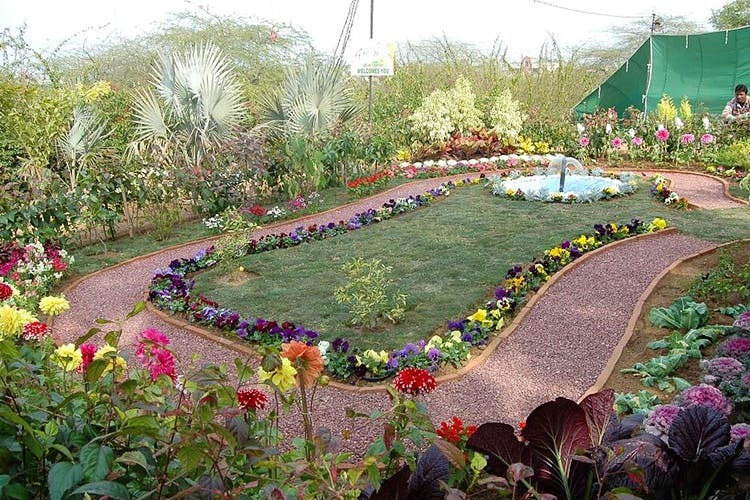 Public Art And Vibrant Blooms, This Saket Garden Has The Best Of Both! If you’re in the mood for a leisurely stroll or want to head out for a picnic, check out the Garden Of Five Senses which combines the beauty of nature with aesthetic art (it is one of Delhi’s biggest public art collection!). Expect sandstone elephants, trees made of metal flowers and more. A stone’s throw away from the Saket metro station, this garden is ideal for when you want to seize the moment on a good weather day (on the rare occasion that happens). Make sure you’ve got ample time on your hands (at least 3-4 hours), since it is huge and there’s plenty to see. We’re talking Mughal Garden-inspired Khaas Bagh with a spiral walkway, an elephant troop made of sandstone, stone-crafted students reading their books, fascinating man-made trees (like one made entirely of metal bells and a few constructed wholly of metal flowers), a solar energy park, water lilies, and more. They also have an amphitheatre where they keep hosting exciting events. You may get to attend one of these if you’re visiting on a weekend. With a gorgeous variety of fragrant flowers, amazing sculptures and food and shopping courts, it is no surprise that the lush green place is one of the most popular haunts for couples in the city. So, we suggest making any family trips during the morning hours when the crowd is relatively less PG-13. When hunger kicks in post all the exploration, you can head to Gate no. 1 for a fancy meal at Fio Country Kitchen and Bar or, you can make a five minute trip to cosy cafes and eateries in Saidulajab village or Champa Gali like the Rose Cafe, Blue Tokai Coffee Roasters, Jugmug Thela, Pho King and more. We love the Garden Of Five Senses for its aesthetic appeal and its convenient location near awesome food spots. Catch this place to enjoy some peace away from the city noise. The entry will cost you just INR 35.